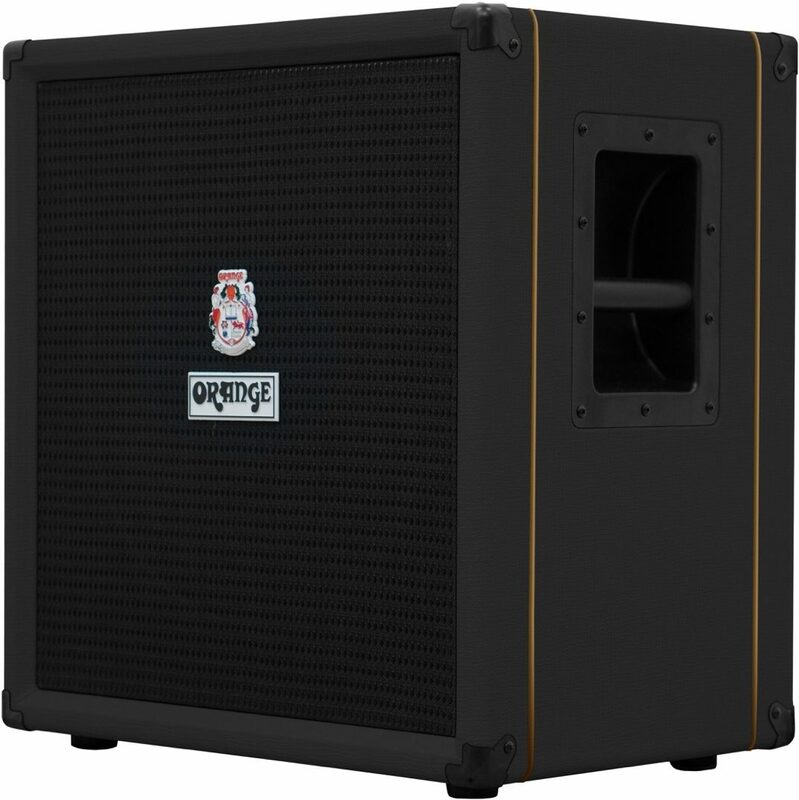 A seriously versatile combo with detailed lows and enough power for smaller venues. Coupled to the output stage is an equally powerful preamp. 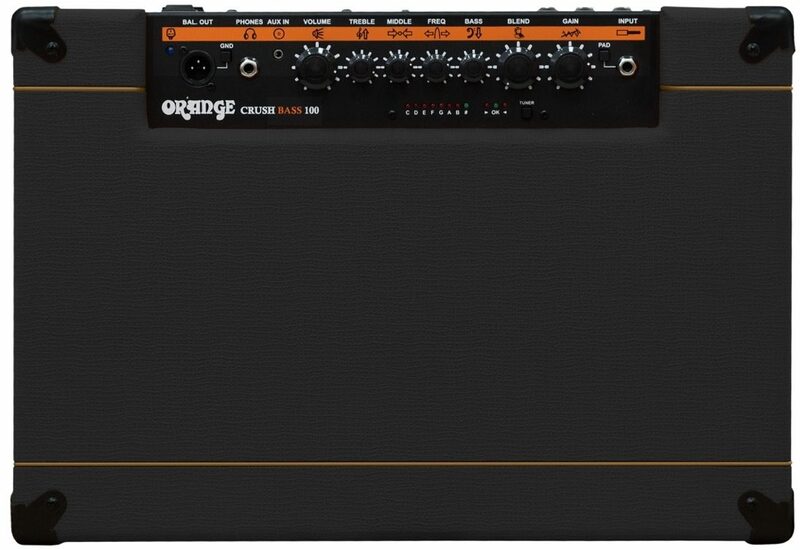 The active EQ section with its sweepable parametric mid band allows players to fine tune the Crush Bass 100 to any style, plus Orange's 'bi-amp' inspired Gain and Blend circuit adds even more tonal variety. These interactive controls add extra harmonic content and variable levels of grit to the core bass tone, perfect for creating earthy vintage riffs or even savagely distorted mayhem, without ever losing the all-important low end. They can also be switched in remotely via the optional footswitch. Along with a balanced line output, the Crush Bass 100 also has a buffered effects loop, an integrated tuner, aux. input and a Cabsim-loaded headphone output for silent practice. From the bedroom to the stage, this amp covers all bases. 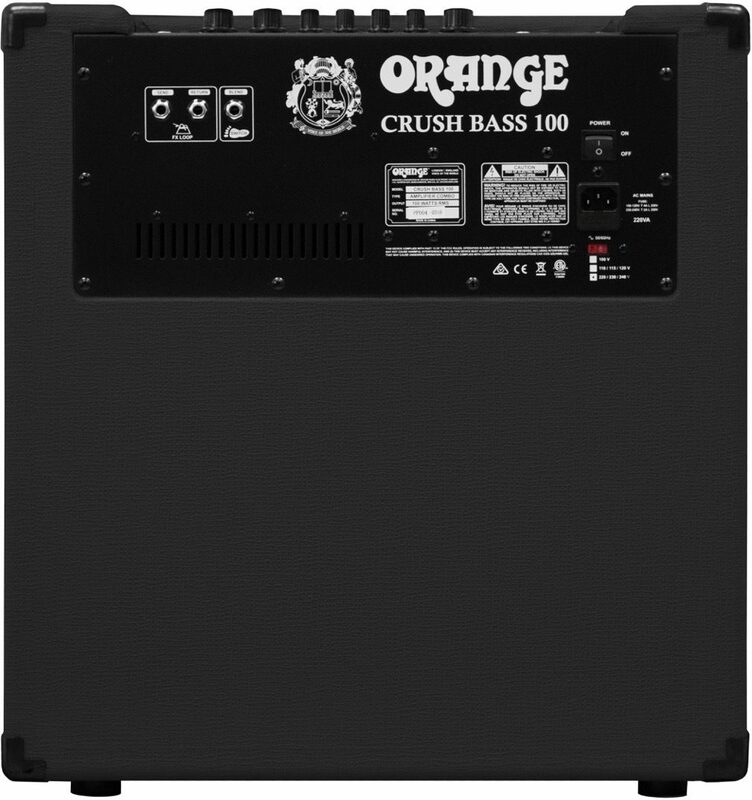 The Crush Bass 100 features an EQ circuit inspired by Orange's prestigious 4 Stroke Series amplifiers. At its centre is a parametric mid band. This presents players with a much greater degree of control over the sound than a traditional EQ, allowing them to vary the frequencies they want hear. 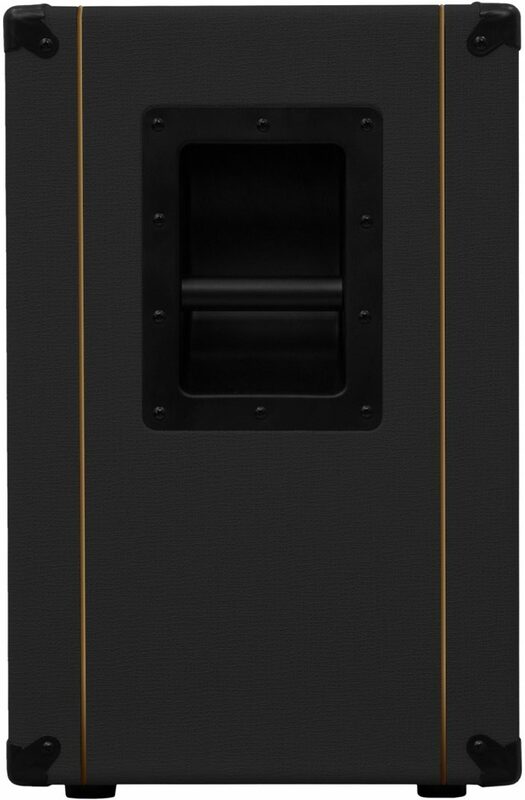 The mid band covers a wide range, sweeping from 300Hz (fully anti-clockwise) to 2.7kHz (fully clockwise), meaning this amp can be fine-tuned to suite any musical style. The active circuitry allows for up to 15dB of boost or cut on the bass and middle frequencies, and up to 20dB on the treble side. 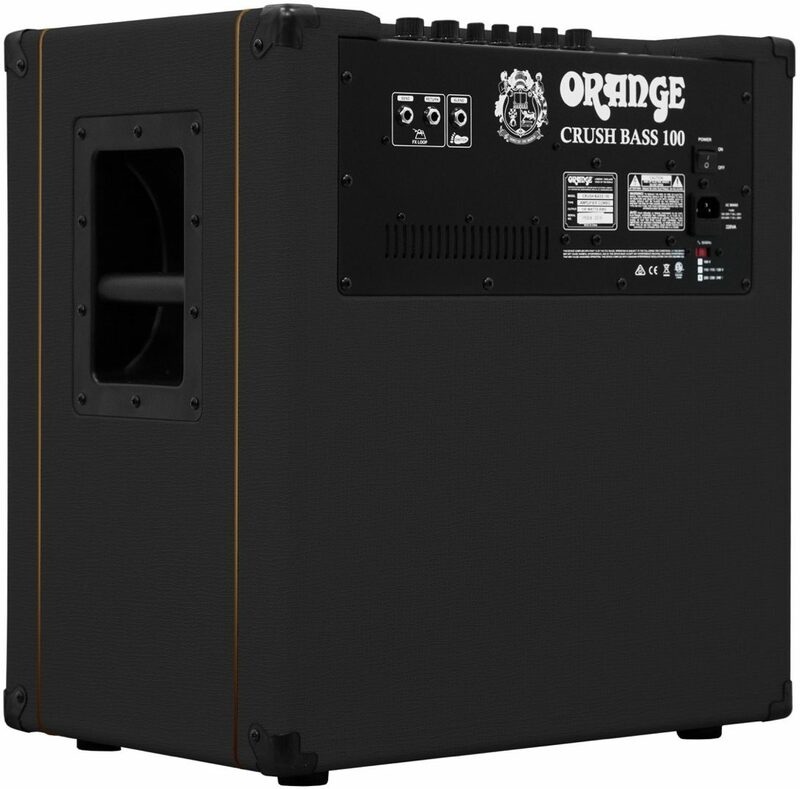 Lifted straight from Orange's popular OB1 Series amps, the Blend and Gain controls are a nod to the many bass players who experiment with guitar and bass amps simultaneously. In this 'bi-amped' setup, layers of harmonics and distortion from the guitar amp are blended with the core bass tone to create the ultimate full-range live sound. The Crush Bass 100's Gain and Blend controls create the same effect in a single package, adding extra bite and crispness to the tone at lower gain settings, right up to all-out filth with the dials cranked. These controls can also be engaged remotely with the optional FS-1 footswitch, ideal for fattening your sound on the fly. The Crush Bass 100 features a balanced output (post EQ) for connecting to a PA for live situations. 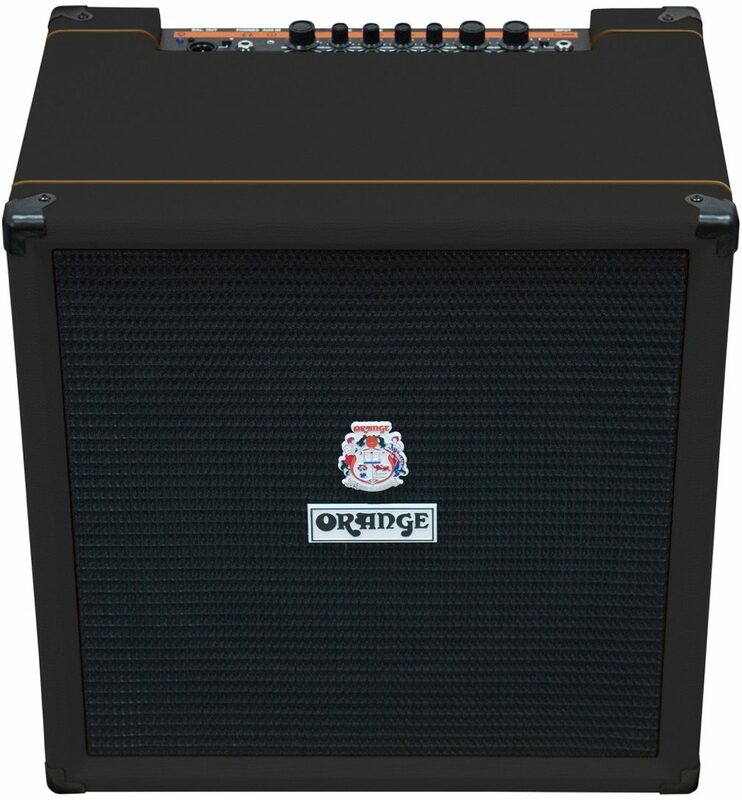 The headphone output features Cabsim circuitry which emulates the response of Orange's stage-ready OBC bass speaker cabinets during silent practice. This signal can also be sent to a console for seriously authentic direct recording. The aux. input allows for connecting external audio sources for backing tracks whilst the handy onboard tuner makes for quick tune-ups between jams. Sound: The sound is so full and rich. The parametric sweep is amazing. The Blend actually blends the gain together with the clean sound instead of just distorting the signal...amazing. Feature: The FS-1 footswitch DOES work and will switch between clean and blended gain (I know, I bought one) it is VERY well built and even the feel of the knobs is quality. Ease of Use: So simple a child could figure it out. No joke...the blend control has a picture of a blender over it. Simple enough??? Quality: Built like a tank...I am so impressed with this Orange (and ZZOUNDS) have a customer for LIFE. Value: Worth every penny. 110% Manufacturer Support: Not yet...hope to not have to find out....fingers crossed (and everything else!) The Wow Factor: Its an ORANGE amp, you CAN'T miss it in the room for sure. I think its so beautiful its ART. Overall: The sound is so full and rich. The parametric sweep is amazing. The Blend actually blends the gain together with the clean sound instead of just distorting the signal...amazing. The FS-1 footswitch DOES work and will switch between clean and blended gain (I know, I bought one) it is VERY well built and even the feel of the knobs is quality. So simple a child could figure it out. No joke...the blend control has a picture of a blender over it. Simple enough??? Its an ORANGE amp, you CAN'T miss it in the room for sure. I think its so beautiful its ART. This is my first Orange amp and I see a head and cabinet in my future..they (and zZounds) have a customer for life. Style of Music: Sabbathy Rock, metal, blues.